Designed to accept Graver and competitive High Flow Series large geometry filter elements. 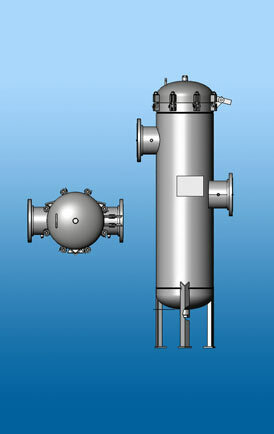 Available in both vertical and horizontal orientations, the High Flow housings can accept from 1 to 7 filter elements. Also available is a single round tipped horizontal design that allows easier removal without the need for a platform and readily drains from back of vessel to eliminate fluid spills. Graver Technologies, LLC serves the industrial filtration, separation, and purification needs of companies around the globe. We offer a broad selection of high performance specialty ion exchange resins, proprietary adsorbents, and filtration products for the most demanding application environments. Our products are used to efficiently remove particulate and soluble contaminants from a broad range of fluids and gases. Because of the breadth of our technologies and the depth of our scientific and analytical resources, we are often called upon to solve our customers’ most challenging problems.